Druzhba Hotel is located in the centre of Luhansk, 550 metres from the Puppet Theatre. It features a sauna and billiards lounge. Free Wi-Fi and private parking are provided. The two on-site restaurants offer various Ukrainian and European dishes, and guests can have a drink in the bar. All bright rooms come with air conditioning, a TV, kettle and minibar. Some of them are decorated in traditional Ukrainian style. Guests can relax in a sauna or steam bath, and to order massage services. Also it is possible to visit a beauty salon. The nearest bus stop on Soroki Steet is located just in front of Druzhba Hotel. Luhansk Railway Station is 7 km away, and the distance to the airport is 19 km. Located less than 3 km from Lugansk Train Station, these apartments feature free Wi-Fi and a fully equipped kitchen. Lugansk’s historic centre is 5 minutes’ drive away. Each apartment at Lugansk Centre Apartments is decorated in a classic-style and includes cable TV. A hairdryer is provided in the bathrooms. Meals can be cooked in the fully equipped kitchen, which comes complete with a stove, fridge and microwave. Cafés and restaurants can be found within a 10-minute walk from the apartments. Lugansk Drama Theatre and the Square of Heroes of the Great Patriotic War is 5 minutes’ walk from Lugansk Centre Apartments. It is 18 km from Lugansk Airport. 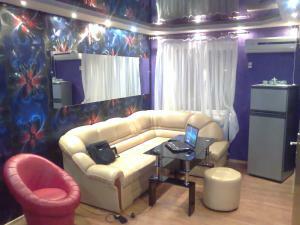 Featuring free Wi-Fi and a terrace, this hotel is located 8 km from Lugansk city centre. It offers billiards and table tennis, as well as room with air conditioning. Each room at Domino Hotel is decorated in a classic style and includes a flat-screen TV. A hairdryer and shower are provided in the bathrooms. Domino’s restaurant serves Ukrainian cuisine, and barbecue facilities are also available on site. Lugansk Airport is 11 km from Domino Hotel, and a shuttle service is provided on request.